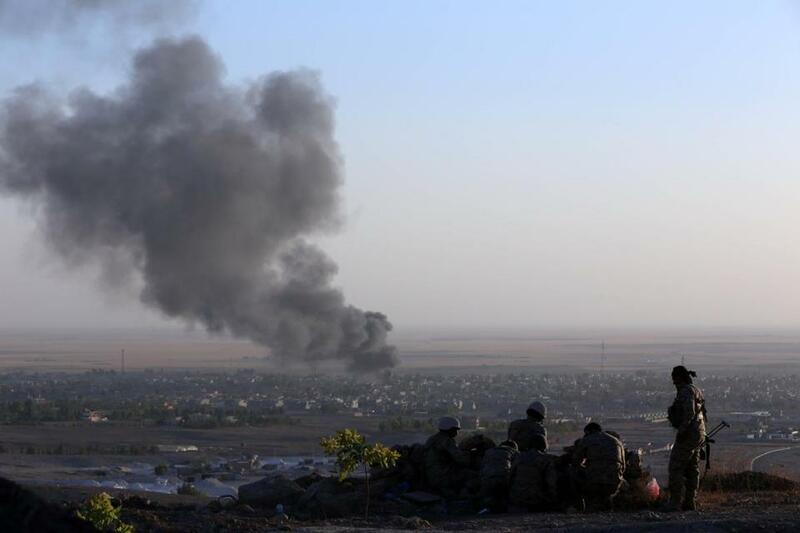 Kurdish peshmerga fighters looked on as smoke billowed from the town of Makhmur, about 175 miles north of Baghdad, during clashes with the Islamic State earlier in August. Stoking the panic has been a very excitable press. On CNN last week, I was asked if Islamic State fighters represented an “existential threat” to the United States. Set aside that absurdity; no terrorist group threatens our existence. (America has faced one existential threat in modern times — the Soviet nuclear arsenal — and that is it.) But is the Islamic State a huge and menacing terrorist threat? Certainly not to the United States today. The danger to Iraq and its neighbors is real. The Islamic State has shown itself to be a formidable insurgency. Its focus is on ripping apart Iraq and Syria, sowing sectarian conflict, and creating in its midst a new jihadist state or caliphate. (That very word seems to incite fearmongers: “Every day that goes by, ISIS builds up its caliphate, and it becomes a direct threat to the United States,” said New York Representative Peter King, conjuring an image of a new Golden Horde with nuclear-tipped scimitars.) If the insurgency grows, and the threat to Jordan or Lebanon increases, we may have to act. But, for now, it’s important to understand that even if marauding operatives in Land Cruisers may be humiliating Iraq’s hollowed-out military, that doesn’t mean they have genuine terrorist skills. Consider the details: The Islamic State has never carried out a significant attack outside of its neighborhood. In 2005, when its operatives were still part of Al Qaeda in Iraq, operatives carried out hotel bombings in Jordan and tried and failed to attack an American warship in the Red Sea. More recently, four people were killed in an apparent lone-wolf attack at the Jewish museum in Brussels by a young man trained in Syria. In other words, we’ve seen no demonstrated ability to carry out the kind of complex international strike that kills dozens or hundreds, let alone engulfs a US city in flames. That is not to say Islamic State militants couldn’t develop those capabilities. As I wrote on this page in June, a vast ungoverned area has opened up in Syria and Iraq, opening up more space for terrorism to thrive. Additionally, the Islamic State’s cause has attracted foreign fighters from Europe and, in small numbers, America. Those are the people to worry about, since they have useful passports and the ability to operate in the West. What’s more, the group appears to be attracting attention from other jihadist organizations. Possibly the greatest risk today continues to be from Yemen, home to the same bomb makers who armed a young Nigerian, Umar Farouk Abdulmutallab, with a hard-to-detect explosive sewn into his underwear and put him on a 2009 flight bound for Detroit. If these technicians join forces with the Islamic State, the threat level will go up markedly. These risks, however, don’t argue for abandoning the administration’s current targeted strategy in Iraq and instead launching a wide-ranging air campaign. To begin with, bombing insurgent formations isn’t going to reduce terrorism. The cells to worry over aren’t headed toward Erbil or Baghdad. More importantly, to deal with a terrorist group like the Islamic State requires local partners, and those partners will have to be Iraqis. That’s why it is vital that a new government is formed in Baghdad with a renewed effort at inclusiveness among Shia, Sunnis, and Kurds. As the White House recognizes, if that effort fails, and the sectarianism persists, Iraq will disintegrate. And if the United States takes ownership of fighting the Islamic State, Iraq’s common security problem, there’d be little incentive for cooperation. Ultimately, a more fearsome civil war will occur, and the danger to the West will expand exponentially. Terrorists thrive in conflict zones. Yes, we probably have a confrontation with the Islamic State — a group with a desire to kill Americans in its DNA — in our future. It’s a good bet that within a year or two, there will be extensive American intelligence operations throughout Iraq, and US drones flying its skies. As we head toward that eventuality, however, we should remember the critical advances (despite Edward Snowden) in US intelligence gathering since 9/11. We can’t stop every solo operative who gets his hands on a rifle or even gunpowder and ball bearings — but that reality doesn’t threaten our existence. And hysteria and missteps in the field aren’t going to make us safer. Daniel Benjamin was ambassador-at-large and coordinator for counterterrorism at the State Department from 2009 to 2012. He is now director of Dartmouth’s John Sloan Dickey Center for International Understanding.